Central pedestal surmounted by figure of Britannia. Pedestal is flanked by arching walls with figure of a serviceman at each end. Inscription on the plinth and walls Britannia stands with right hand raised whilst in her left she holds a spray of laurel and carries a round shield decorated with sea horses. On her head is a helmet topped by a ship's prow with a sea horse crest. Bronze swags placed around the upper edge of the pedestal. A soldier of 1685 stands at the left end of the wall and a soldier of 1902 stands at the right end of the wall. Guns and other military equipment lie on the sloping step at the foot of the pedestal intermingled with wreaths and palms and covered with the union flag. Laurel wreath placed in front. 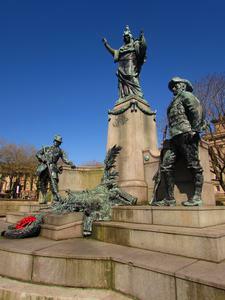 At the rear of the memorial, on the pedestal, is the regimental badge, a sphinx and a laurel twig device. Below this is the figure of a drummer boy dressed in the uniform of 1743. He sits on a rock beating a call to arms. Behind him are banners, a cannon and a musket. The Times 11 Sep. 1905 p.5 Report of FM White's speech. Before the ceremony the Lord Mayor presented him with a silver salver engraved with a design of the front portion of the memorial. Public Sculpture of Britain Liverpool (1997) pp. 177-180. Detailed description and history quoting references. Local Publication/Booklet ' Mercury'7 Ap. 1903; 11 Sep. 1905. Local Publication/Booklet 'Courier' 9 Sep. 1905; 11 Sep. 1905. For Remembrance and in Honour of Those Who Lost Their Lives in the South African War 1899-1902 by Gildea, James 100 Published:Eyre and Spottiswoode 1911 London Includes names of the six officers died in South Africa.